Maintaining sugar maple as a resource is important for Vermont as it plays a significant role in the state’s economy. Researchers have struggled with pinpointing the relationship between long-term climate data and sugar maple condition, as climate conditions have rarely been included in sugar maple decline studies. This study by Evan Oswald, Jennifer Pontius, Shelly Rayback, and Lesley-Ann Dupigny-Giroux from the University of Vermont, Paul Schaberg from the USDA Forest Service Northern Research Station, and Sandra Wilmot from the Vermont Department of Forests, Parks and Recreation shows some of the potential impacts of climate change on sugar maple, and the difficulties that could arise for management of this key Vermont tree species. By better understanding these potential impacts, forest management strategies can be targeted to areas where they are most likely to be successful. Sugar maple is an environmentally-sensitive species, which has experienced episodes of decline since the early 1900s, including declining growth trends in the last few decades. This study compared annual sugar maple crown condition from 1988 to 2012 with ecologically significant climate metrics, including: mean, minimum and maximum monthly temperatures, growing season length, and early frost events. Results of this study showed that certain historical climactic changes were associated with reduced crown health in sugar maple. The timing, coincidence and/or consecutive nature of extreme climate events all contributed to sugar maple health. Sugar maple health decreased when associated with higher minimum temperatures in April and October and extremely warm days in August and January. 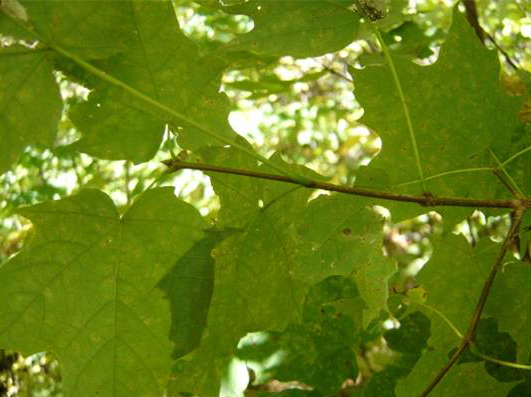 Higher minimum temperatures in August were associated with improvements in sugar maple condition. The study also examined future estimated impacts of climate change on sugar maple health. Under both the high and low emission climate change scenarios, increases in the severity of climate-driven stress were found. Using the low emissions scenario, the study projected that 55% of sugar maple in Vermont would likely experience moderate to severe climate-driven stress by 2071. This percentage increases to 84% under the high emissions scenario. The projected declines were mostly caused by increased April and October minimum temperatures, showing that shoulder seasons (the transitional time between peak winter and summer) are important for predicting sugar maple vulnerability to decline. The study also found that the importance of climate stress will likely shift over time, with shoulder season effects being more important in the near future and extreme summer heat causing more impacts in the more distant future. Additionally, spatial data were examined to determine which locations in Vermont have favorable climate conditions for sugar maple over the historic record. Results showed that the Champlain Valley of Vermont fared the best under projected climate change conditions and the Northeast Kingdom was the most adversely impacted by climate. Overall, this study expands understanding of how climate change may influence sugar maple success and distribution. To help guarantee the continued sustainability of this resource, land managers should take steps to ensure sugar maple stands are protected and conserved, especially in areas anticipated to experience greater stress from climate change.